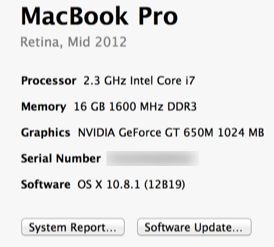 Early August I took delivery of a Macbook Pro with Retina display, with a slightly bumped up spec over the base. This is the first Mac i’ve owned, and the first chance i’ve had to really try the OS. I’ve always had Windows Laptops before, and the reason I bought the Macbook wasn’t because there is anything wrong with Windows, simply that the spec of the Macbook hardware is what I was after, plain and simple. It’s very light for it’s size and more than powerful enough for my development activities. There seemed to be a distinct lack of notebooks and ultrabooks I could buy with a 16GB memory configuration. Having 16GB of RAM means I am more than able to run Windows virtualised, rather than having to boot into it via Boot Camp. I’ve used VM’s for development in work plenty of times before running in VMWare Workstation, and at times it has been a flaky experience. At the end of the day, i’m a huge Windows fan, and I spend most of my working week in Visual Studio, so I will always want to run Windows. I chose Parallels Desktop for Mac on the advice of a friend and haven’t looked back since. Windows 7 (and now Windows 8) run silky smooth and when in full screen it feels like i’m running it on bare metal rather than virtualised. I tried Coherence mode which i’d heard a lot about. And although it works much better than Unity mode in VMWare Workstation, I still like to feel as though i’m running Windows fully rather than just using Windows app from within Mac OS X. Once i’d tweaked the settings in Parallels I found I was running Windows 8 and forgetting completely that it was a VM, or that I was even using a Mac. I’ve been using the machine for around a month now and it’s been a very pleasant experience and I find that I now switch between Windows and Mac seamlessly as part of my workflow. I’m going to cover in another post how I have Parallels setup to get (what I believe to be) the optimal experience. The way it works and integrates Mac OS and Windows out of the box is really impressive! Overall I have to admit, I do like Apple’s desktop operating system. Visually I think it looks good, albeit slightly more dated looking than Windows 7 and 8. The thing that really makes the OS a joy to use though are the multi-touch gestures. I have never been a fan of trackpads, but I find that the gestures are implemented so well that I can’t imagine using a Mac without them. It may seem like a small thing, but once you get used to them they really speed up your use of the system, and it’s nice to see Microsoft implementing gestures in Windows 8.